Try and unearth the fortune of One-Eyed Willy in The Goonies, a 5 reel, 20 payline video slot that’s based on the ever popular 1985 film comedy. Created by Blueprint Gaming, it’s packed full of extras including 6 modifier boosts as well as 6 bonus features that award free spins, pick me prizes and spin the wheel bonuses. Play this colourful game on your PC, tablet or mobile from between 20p and £500 per spin. Like other branded video slots from Blueprint Gaming, the design here is classily done. The reels are set against a treasure map backdrop and include lower value royal values as well as weighing scales, skeletons, pirate ships and treasure chests full of gold. The super stacked skull and cross bones flag is the most lucrative, paying 50 times your bet if you land 5 on a payline. There’s also a wild that replaces all other symbols bar the Bonus. It too delivers awards up to 50 times your stake. Truffle Shuffle Wilds feature – new wilds are overlaid to create extra winning chances. Mikey’s Hidden Riches feature – a stacked wild can be added to any reel and a new payout calculation is made. Data’s Colossal Symbols feature – you could see 3 adjacent symbols sync together to create a Colossal Reel filled with a single symbol. Mouth’s Lucky Coins feature – all the gold coin symbols on display turn into the same matching mystery symbol. One-Eyed Willy’s Bonus Boost feature – your chances of triggering the feature rounds are boosted thanks to the extra Bonus symbols spinning around the reels. Sloth’s Win Spin feature – you’re guaranteed to land a big win spin. Fratelli Hideout Bonus feature – you’ll be offered a selection of keys. Pick to reveal a cash prize, a collect or a Hidden Tunnel icon which offers a shot at triggering 1 of the other features. Skeleton Organ Bonus feature – the keys here award multipliers which are applied to your total stake. Pick an upgrade and you’ll get a multiplier boost. Again, you can trigger other rounds here. Keep on picking until you lose 3 lives. Super Sloth Free Spins feature – you’ll head to a new set of reels that feature the Fratelli family. Hope to see the Super Sloth Wild as this turns any Fratellis on view into the same top paying symbol. After you’ve had your final free spin, choose a chest. If you land a Super Sloth you’ll get extra free spins, a Collect ends the feature or One-Eyed Willy’s Treasure Bonus awards the final feature. 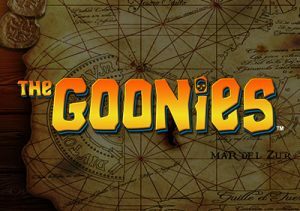 Goonies Go Wild Free Spins feature – 1 of the top reel symbols will turn wild following each free spin. There are more pick me possibilities at the end of the feature with extra free spins with all the Goonies symbols wild on offer. You could also get a trigger of One-Eyed Willy’s Treasure. Inferno Free Spins feature – on each free spin, Inferno moves right to left across the reels turning between 1 and 3 consecutive reels Wild. Spin the wheel for a collect, more free spins or One-Eyed Willy’s Treasure feature. One-Eyed Willy’s Treasure Bonus feature – the final round is reached from the other bonuses or if you’re lucky enough to land 5 Bonus symbols on the same base game spin. Then, spin the wheel. Multipliers are applied to your total stake depending on where the pointer lands. Keep on spinning until the booby trap brings the spins to a close. If you’re a bit underwhelmed by which feature you’ve been awarded, you can gamble and try and land a potentially more lucrative one. Blueprint Gaming has kept to its tried and tested formula in The Goonies. The high spec sound and visuals are impressively done and just what we’ve come to expect from the developer’s branded content. The same goes for the range of extras. We can’t think of many video slots which offer quite as much variety on the features front as The Goonies does. If you like a good selection of bonus features, you’ll find plenty here. The variance is in the medium range. The Goonies has legions of fans around the globe. If you’re one of them, you should find plenty to like in this faithful adaptation. Even if the charms of Sloth Fratelli and chums have passed you by, the range of extras on offer make The Goonies worth a spin. I also recommend you try some of their other branded titles with Ted worth playing.